Imagine Africa without the mighty lion - a kingdom without a king. Nothing would be more devastating to this continent and its economy than losing this iconic majestic animal. And there's no way of saving iconic African wildlife without getting the local communities involved. That's because wildlife conservation and community work go hand in hand. With this project volunteers will play a vital part in the lion conservation efforts, but also working in schools, teaching kids the importance of the magnificent wildlife alongside which they live. The key for conservation is education. Be part of the research team that studies minute by minute the different behaviours of the Dambwa pride. Participate in body conditioning scores, social behaviour studies and see how they really function in the wild. Enjoy unique and unforgettable close encounters with magnificent African lions by caring for the resident captive giants, feeding them and cleaning their enclosures while getting to know their personalities. Also take part in behavioural enrichment activties by making toys from natural materials to stimullate their predatory and sensory behaviours. Help out with reserve management activities including snare sweeps, road repairs, erosion control and fire breaks. Become much more than a teacher and more of a role model when helping the kids that are falling behind in their education, by providing one-to-one support that otherwise they would not get. Assist with outreach initiatives in the local communities by delivering conservation education lessons in local schools. At an additional cost fill the weekends with adrenaline activities such as bungee jumping and white water rafting. Take advantage of optional trips to wildlife havens like Botswana's Chobe National Park or visit the sister project in Victoria Falls, Zimbabwe where there is the chance to walk with the cubs on a day trip. And enjoy the mighty Victoria Falls from a microlight flight or take a swim in Devil's Pool (seasonal). Make friends for life with other international volunteers while playing a vital role in the conservation of one of the Seven Natural Wonders of the World and World Heritage Site, the magnificent Victoria Falls and also the Mosi-oa-Tunya National Park. Volunteers will alternate their days between lion conservation work and community projects. Both are rewarding, unforgettble and satisfying experiences. African lion populations have been declining by an astonishing 43% from 1993 to 2018 according to IUCN research. That means that from 300,000 lions 25 years ago, only slightly over 22,000 remain in the wild across Africa today. 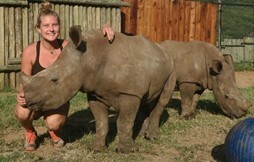 The decrease in population is higher than any other species including the rhino. This is why the ground-breaking Lion Release Programme was launched in 2004. 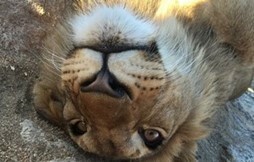 The staged lion release programme aims to release the wild offspring of captive bred lions into appropriate national parks and reserves across Africa. But in order to do this, the help of volunteers is needed. Volunteers will meet the Dambwa pride and will play a vital role in collecting data on these lions that are proving that the offspring born within the managed reserve are suitable candidates for release into the wild. Africa's food chain depends on its apex predator. Losing it would affect every single creature, including humans. Saving the lion is saving Africa and its communities from having an empty throne. Increasing human populations put wildlife at risk on every level. Competition for resources and especially for space in the African savannah creates a human-wildlife conflict that can only be resolved through education. Because wildlife conservation and community development go hand in hand, volunteers will also work with communities to educate them on meeting the challenges of living alongside dangerous predators. Conducting research to improve our understanding of the lion's behaviour in Africa's ecosystems helps to minimise humqn-lion conflict within the surrounding communities. Besides striving to make a lasting impact in the lives of local communities with educational support, it is essential to understand the connection between that and the significance of living near dangerous wildlife. 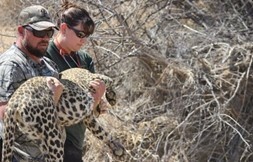 Volunteers will help to collect data on the release pride, which seeks to evaluate whether the captive-born pride is functioning on a similar level to a wild-born pride, and researching into a variety of social, territorial and hunting behaviours. Volunteers will also be involved in a number of other lion management activities such as behavioural enrichment, enclosure cleaning and meat preparation to ensure the welfare of the resident captive lions. Volunteers will participate in a front line conservation initiative in the National Park Mosi-oa-Tunya on the bank of the Zambezi River overlooking Victoria Falls. They will get involved in snare sweeps as part of anti-poaching patrols and expand their knowledge of the African bush in a unique way. Volunteers will assist in local schools in a number of ways, including upgrading school factilities through refurbishments, providing pupils with more individual attention and preparing and giving lessons in subjects such as conservation education, English literacy, numeracy and basic life skills courses. It is in this way that children with positive role models learn to eventually make a different in the world in which they live. Below is an example of how a week in the life of a volunteer could look. However, due to the nature of the project these activities may change on a daily basis. These activities are not included in the price, but volunteers can do any of them during their spare time. 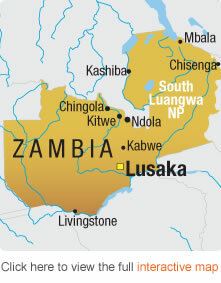 Volunteers should fly into Livingstone Airport in Zambia, also known as Harry Mwaanga Nkumbula International Airport, where they will be met by a member of staff and taken to the volunteer base. 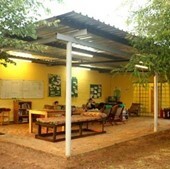 Most volunteers fly into Johannesburg Airport and then take a connecting flight to Livingstone from there. An airport transfer can be arranged between 8.00 am and 6.00 pm and will take approximately 15 minutes from the airport. Amanzi Travel holds an ATOL licence and we can help with any flight requirements upon request. 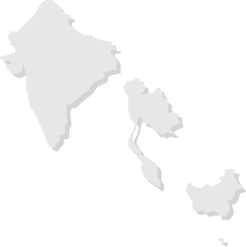 Volunteers will be staying on q private section of a two-hectare property in basic but comfortable chalets that can house up to three people. There is also a common lounge room, a recreational area and toilet and shower facilities attached. It's a perfect place to relax at the end of the day while sharing unforgettable memories with fellow volunteers. There is plenty of space for ball games and other outdoor activities. 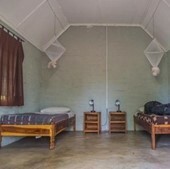 The accommodation is only a short ride away from Livingstone Town (just 3 kilometres from the town centre) which is a great place to spend a day off. Besides a grand view of the Falls it is posible to get to know something of the history of Zambia in the local museums and popular art gallery. The town of Livingstone is located in the heart of an area unmatched for its beauty and a wide range of activities in which to take part. It is a tourist hot spot with lots of people and culture but with the main attractiion of the Falls themselves. 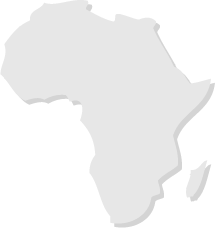 It is known as the adventure capital of Africa. Evening meals will be prepared on site and are really yummy! I booked my two week Zambia Lion Encounter volunteer vacation through Amanzi Travel and I would book another vacation through them in a heart beat! Throughout the entire process the staff at Amanzi, especially Gemma and Ingrid, who were both amazingly helpful. I am afraid because of my circumstances I was the "problem traveler" but you never would have know it because of their patience, and even working on weekends to make sure I got to my vacation! I have wanted to go to Africa and work with lions since I read Living Free by Joy Adamson when I was eight years old and Amanzi Travel helped make that dream come true. For two weeks I got to work with lions every day. I was also able to enjoy white water rafting on the Zambezi River, Zip lining at Victoria Falls and a day safari at Chobe National Park in Botswana! The whole trip was a dream come true and the next time I need help fulfilling a dream I will call Amanzi Travel first thing! Words cannot express how much I loved my 2 weeks in Zambia! Walking with lions each day, brilliant deep blue skies, smiles and laughter and a fantastic group of volunteers and staff. I didn't want to come home! Thanks for such an amazing trip! I was assisted by Pat Hinton. She is so friendly and helpful and made me really enjoy the contact I had with Amanzi Travel. The staff on the project are great, they really get to know the volunteers and make them feel very welcome. The rooms are great too, though you never know what different bugs and spiders will be waiting in there for you! The activities were so enjoyable, some of the jobs made us feel that we worked really hard which is rewarding because it was all for the lions. This project has excellent aims. It may take a while to release lions but they are well on their way, lions they release will be completely wild and will have had no contact with humans. They have a good chance of saving lion populations. The volunteers are there to feed the lions and walk them. When the lions are walking in the bush they are feeling what it's like to be wild. I feel that this is just as important as releasing wild lions as it nourishes the captive bred and gives them a great life as well as giving the volunteers an unforgettable experience. I had an absolutely brilliant experience. Every day brought a new surprise but that's part of the fun! The lions are amazing creatures, stroking and being licked by a lion is something i will never forget. Within a few days we all knew their personalities and which one was better to stroke. It was surreal, but one of the best experiences I've ever had. They are such relaxed and lovable animals, I would definitely go back to this project. Just to let you know, James & Charlotte have returned safely from their 2 week trip to the Livingstone and they have had an absolutely amazing time. They have both fully enjoyed the experience and it was far more hands-on with the lions than they could have imagined. At no point did they feel un-safe. They fully immersed themselves in as many of the tasks and activities that they could do including a full day white water rafting down the Zambezi and jumping into Devil’s Pool at the edge of the Victoria Falls. James would like to return next year but Charlotte is already committed to go to Malawi for 3 weeks with her school. 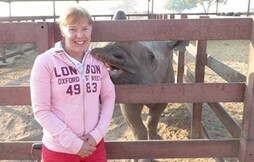 They have made some great friends and are keeping in touch the staff in Livingstone. Best wishes and I hope to organise future experiences through Amanzi. 'This was the most amazing experience ever! I walked lions in Zambia and I cannot wait to go back an do it all again. I cant even describe how totally awe inspiring it was. Even enclosure cleaning and meat prep could not put me off - in fact you even get to enjoy it! It is a humbling experience especially after talking with the project manager as you realise the extent of what the project is trying to achieve. It really gives you a new perspective and I have come back wondering what I can do now to help. From the start of the process at initial enquiry right through to the last minute vaccination updates Amanzi were totally awesome. They answered all questions quickly and were so friendly and helpful. I had a great time! With the animals and with the people. I would definitely recommend it, because it's such an experience to be 4 weeks in a complete different world. It's also nice that you know you can help the programme as much as you can. I wanted to say thank you as I had the most amazing experience and will be definately be returning to the project as soon as I can. On that note - how far in advance can you book? The people and staff have been so welcoming and I will really miss the cubs. Just letting you know we had the best time here! We happened to be here for the first lion release! Today five lions will be released into Stage 2 and there will be dignitaries, kings and many others for the celebration. We have been working hard and becoming lion walkers! Love it! I had and amanzing experience with Amanzi Travel. Everything was so simple, they found flights for me at a good price, they picked me up and dropped me off on time. Any questions I had they were very helpful in every way they could be!. I would so recommend this company, it's very safe as safety always comes first with volunteers, pick them if you want to get the best out of your money for a life-changing experience . My project in Zambia (Lion Rehabilitation ) was brilliant and the project co-ordinators went out of their way to ensure we had a brilliant time. It was an absolutely amazing experience and I would love to return in the future! All the staff involved were brilliant at organising activities and had a wealth of knowledge which they were all happy to share. I would truly recommend this experience to everyone . I really would have liked to stay more than 2 weeks!! Congratulations on 4 years of a fantastic company!!! 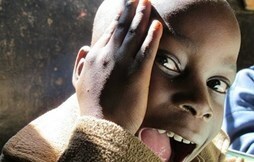 We only ever hear fantastic things from our volunteers through Amanzi Travel!! A massive well done. We believe that the project could succeed in releasing lions into the wild. Management and staff are very committed to their work and have a real passion for lions. Working so closely with the lions and the Zambian people on a daily basis was a fantastic experience and can only be described as life enriching. I would recommend volunteering with these lions to anyone with a passion for animals, it's an experience I'll talk about for years to come. Amanzi Travel made the process simple, and in my view, could not have been more helpful. I had an incredible time, all the staff were excellent, the lions are amazing, the programme itself is remarkable and everything surrounding the last few weeks was fantastic. I just wish I could have stayed a lot longer! I also wanted to say a big thank you for helping me book the trip in the first place. Your knowledge and enthusiasm about the project really came across when we initially spoke. I'll be in touch when I am planning my next trip. Going to Africa and working with the wildlife there had long been a dream of mine, but it wasn’t till I retired from teaching that I was able to go. My three weeks spent in Zambia working with the lions was the best experience of my life so far. Being with the lions on a daily basis and getting so close to them was wonderful. All the people I met on the project, both staff, volunteers and locals were friendly and helpful and the fact that I was by far the oldest volunteer really didn’t matter. I was also able to visit Victoria Falls and Chobe National Part in Botswana, both places not to be missed. I just wished that I could have stayed longer, but I shall certainly return to Africa next year. I feel impressed with the guides and lion handlers and how dedicated everyone is with the work and the research, makes me proud to have been part of a worthwhile project. It’s good to look at life with a different perspective. I feel this is an excellent program, both in helping with the lion re-population issue and the help given to the local community. I have gained a feeling of true self satisfaction in helping with the lion project and great esteem for the work in the local villages. It was awesome to see the smiles on the faces of the children at the schools. 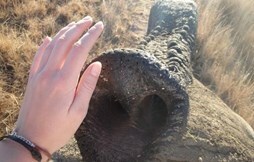 The elephant mitigation bough me great pleasure, due to helping the local community. I loved the lion walks and meeting new friends, I found it a pleasure working with all the staff both at management level, the handlers and staff at the white house. 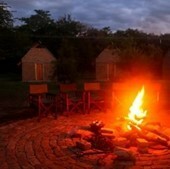 I felt totally safe during my stay both in the accommodation and on lion walks, visits to the villages etc. The staff were very re-assuring and well trained. I felt at total ease, thank you all! It has made me feel more appreciative of what I have at home and given me a first hand experience of the needs of people in other countries such as Zambia and Zimbabwe etc. Great to deal with professional people who treated us sensitively when we had a couple of problems regarding our trip. Thank you! Very valuable project – it is an ethical project with the interest of lions its sole aim. The whole walking with lions experience was truly amazing, and unforgettable. It is great how confident you can feel after only 2 weeks with the lions - we only wish we'd had more time. The days are varied including working in local schools, elephant research and the numerous lion walks (both with and without clients), where you begin to feel like a member of the pride more and more each day. It is the best thing we've ever done, and we are still talking about it now to friends and families. We fell in love with one lion in particular each and have chosen to sponsor them! We look forward to receiving the newsletter to see how they're getting on. It's surprising how you can bond with them so quickly! We're considering going back to volunteer at the next stage already and we're not even home from our round the world trip! The project and experience was amazing.